In 400 BC, Hippocrates, the Father of Medicine, hoists up a patient on a ladder with a series of ropes and pulleys to harness the force gravity in an effort to stretch his patients and relieve their ailments. In the 60’s, Dr. Robert Martin (a California osteopath, chiropractor, and medical doctor) introduced the “Gravity Guidance System” to the country. This concept was revolutionary to the modern world and addressed the effects of gravity on the human body, the simple solution of inversion therapy, and the resulting benefits. Dr. Robert Martin continued his work on, “Inversion Therapy”. In the 70’s he published a book. Together with the Gravity Guidance Inversion Table, the program caught on, experiencing increasing success. This encouraged other companies to enter the inversion market–products like the Bud Leach table and the BackSwing emerged. By the 1980’s the inversion craze was in full swing. Gravity boots were popularized by the 1980 movie “American Gigolo” starring Richard Gere. By 1982, the inversion market had soared to over $70 million, with literally thousands of people incorporating inversion regularly into their lifestyles. It did not take long for other companies to try to duplicate the success of, “Inversion Therapy”. Over forty manufacturers were producing inversion products. There was little apparent differentiation among the products, which caused price wars among the companies. Some manufacturers sacrificed quality so that they could offer cheaper products. The lack of attention to quality resulted in product failures, causing serious, sometimes deadly, harm to consumers. New research was done by a Dr. Goldman who at the beginning was against and condemned the idea of inversion therapy due to the harm it was causing people, mainly due to the cheaper products they were buying. His new studies revealed that you are at no more of a stroke risk hanging upside down than if you are exercising right side up.” He noted that the body actually has mechanisms that prevent damage from hanging upside down: the increase in cerebral spinal fluid supports and protects the vessels. In fact, while oscillating (inverting with movement), some of the patients’ blood pressure actually dropped a few points. These studies were based on patients in generally good health. It is important for you to review all information before using this method to relieve your ailments. Hopefully some of the information I share here with you will provide you to make the knowledgeable choice about inversion. In 2007, the prestigious Newcastle University in England performed a study on patients suffering from sciatic pain and scheduled for surgery. While waiting for surgery, members of a group practiced a regular routine of inversion therapy, while a control group practiced general stretching exercises. The group that practiced inversion therapy realized remarkable results. In April 2008, the Teeter Inversion Table was featured on Good Morning America and received the highest mark of all the fitness equipment they profiled. Teeter inversion products have helped literally thousands of people improve their quality of life. Teeter Inversion is a leader in the industry, setting quality standards for inversion equipment. 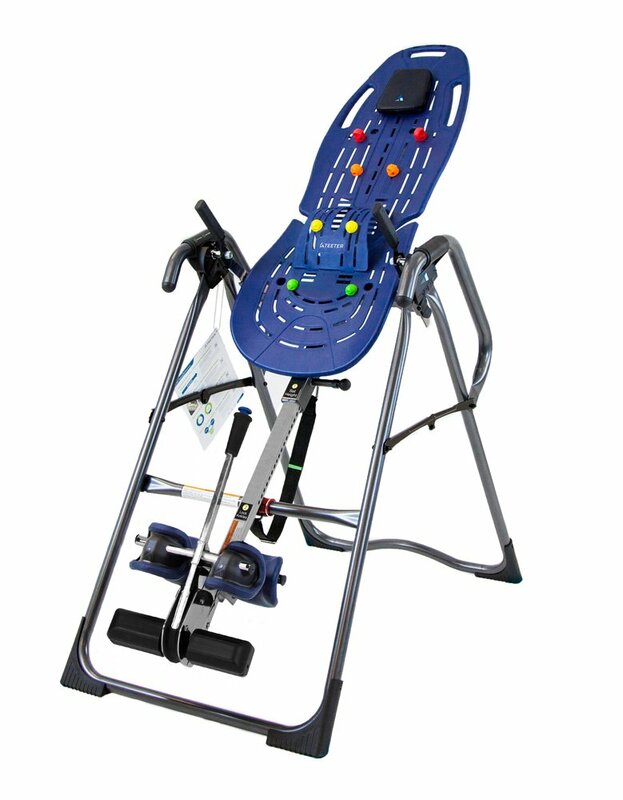 Teeter Inversion tables were the ONLY brand that is both UL safety certified and 510(k) registered with the FDA. 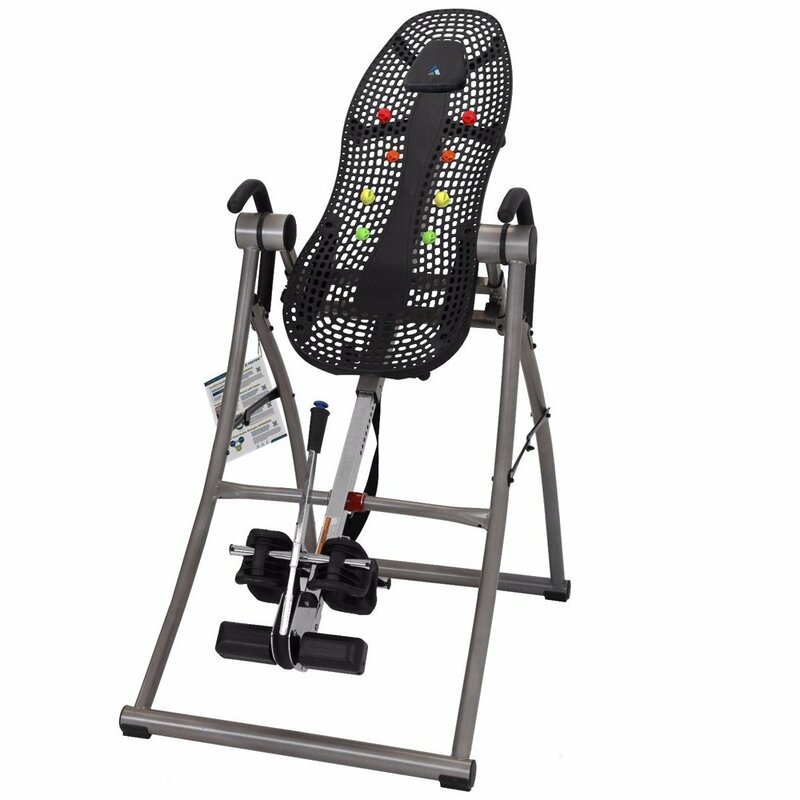 The Teeter Inversion Table helps the body decompress, using your own body weight and gravity to elongate the back, relax tense muscles and relieve back pain. Because it decompresses using the same forces that compress the back while upright, this natural form of traction is comfortable and can be easily done in your own home. When people age, their cartilage, which protects and cushions bones, tends to break down. As the cartilage wears away in the spinal column, the fluid that lubricates the joints of the vertebrae is eventually destroyed too, leaving bone rubbing on bone. Bone spurs begin to develop and take up space between the vertebra where nerve roots exit the spine, pressing into the nerve roots. As the bone spurs begin to grow larger, they can eventually extend into the spinal canal itself. This leads to narrowing of your spinal canal, called spinal stenosis, causing a “pinching” of the spinal cord and/or nerve roots, which leads to pain, cramping, weakness or numbness. Inverted decompression relieves the pressure on the spinal discs and nerves by allowing the discs to rejuvenate and rehydrate. As the discs plump up with hydrating fluids, they help to maintain adequate space and ensure nerves have clearance to exit the spine. The compression of the sciatic nerve causes the painful symptoms, but usually has an underlying cause. Common causes of sciatic nerve pain are herniated discs, bone spurs on the spine, or degenerative disc disease in the lower back, conditions which compress the nerves that exit the spine. Those who used the Teeter showed a 70.5% reduction in the need for surgery! Less pressure means less pain. Routinely decompressing on a Teeter can open up those joints and take the pressure off the nerves to relieve back pain. A published preliminary pilot study compared two groups of patients suffering from Sciatica that were scheduled for lower back surgery. While both groups received physical therapy for 30 days, one group also used a Teeter daily as well. At the completion of the study, those who used the Teeter showed a 70.5% reduction in the need for surgery! Like the discs in your spine, the cartilage in your joints helps to cushion the bones. Degenerative Joint Disease causes cartilage to wear away and become inflamed, leading to painful symptoms like stiffness, instability, joint lockage and even deformity. These symptoms cause discomfort and loss of mobility that can bring your life to a halt if they go untreated. Decompression aids in joint lubrication by altering the pressure and suction forces within the joint, helping to stimulate the synovial fluid that nourishes the cartilage and enhances shock absorption. Mobilization through movement and stretching can also help improve joint health by strengthening surrounding ligaments and muscles. Strong ligaments and muscles support your joints and are vital to protecting yourself from injury. Muscle tension is typically caused by the physiological effects of stress, overuse, under-use or poor posture. Muscle tension refers to the condition in which muscles of the body remain semi-contracted for an extended period, which can cause lactic acid build up, resulting in a painful burning sensation. Teeter works to gently elongate and stretch the para-spinal muscles and soft tissues of the spine, offering relaxation, reduced pain, and greater flexibility. Physiotherapist L.J. Nosse conducted a study focusing on the effect spinal decompression has on muscle tension and found that EMG activity declined by over 35% within 10-seconds of inversion, even at the very shallow angle of 25 degrees. Activity continued to decrease the longer the subjects remained inverted. Even after returning upright, EMG activity was found to be 05% less than before the inversion therapy session! A strong and flexible core is essential to maintaining the neutral spine position. Weak abdominal muscles cause hip flexor muscles to tighten, resulting in loss of proper curvature in the low back. Muscle tension or imbalance can also cause unhealthy posture or misalignments that result in back pain. Decompression helps promote better posture by stretching and elongating tight and weak muscles, helping to combat muscle imbalances and relieve back pain. With muscles at ease and in balance, the spine will work to be in proper alignment. Facet Syndrome develops in the small joints located between each vertebra called facet joints. These joints are lined with cartilage to protect the bone from constant motion. As we age, the cartilage gradually wears away, and in many cases, bone spurs can develop. Friction between the bones leads to the tenderness, swelling, stiffness, and pain in surrounding tissues. Rehabilitation of facet joints starts with movement. Inverted decompression strengthens surrounding muscles and ligaments to help the joints support the vertebrae and correct imbalances to relieve back pain. Using a Teeter also promotes lubrication of facet joints for greater cushion, helping to relieve the pressure that irritates surrounding tissue. A Muscle Spasm is your body’s response to injury or underlying anatomical problems. In the case of an anatomical problem like Degenerative Disc Disease or a Herniated Disc, the muscle instinctively reacts to the pain and inflammation by going into a spasm to protect the injured or damaged area. The human body is designed to stand strong and straight with the ankle, knee, hip and shoulder bones stacked in a vertical line. In poor posture, the surrounding muscles become overworked trying to compensate for the imbalances and cause tension to build in the lower back, neck, shoulders, and hips. That tension not only triggers painful knots and spasms, but also places you at a much higher risk of injury and more serious conditions. Sitting is an unnatural position that forces the spine and surrounding muscles to compress and tighten. The longer you hold that position, the more difficult it becomes to release the pressure and realign the spine to its proper curvature. This leads to chronic back pain, tension headaches, and degradation of the tissues surrounding your joints. When you have poor posture, your body has to work harder to hold you upright, which zaps your energy and mental focus as well. This leads to feeling irritable, tired, and aggravated. Our mind influences the way our body reacts, which is why we slump over and put our heads down when we’re sad or upset. But our mind also reacts to our posture, perking up when our body does. Standing in a strong upright position conveys confidence and decreases cortisol (the stress hormone) in the brain. Even our language reflects this connection between proper posture and emotional effect – someone weak is called spineless and someone proud has a backbone. Sitting for extended periods of time, especially with your legs crossed, can negatively impact your circulation. Your heart and lungs are forced to work harder to pump blood and circulate oxygen, which causes undue stress on your internal organs and muscles and makes it more difficult to breathe. When properly aligned, the spine absorbs shock and keeps you balanced. When your muscles become tight due to poor posture however, they pull the spine away from the center line. If this poor posture is repeated over time forms into an unnatural position (scoliosis, lordosis, or kyphosis) that causes severe pain, limited mobility, poor balance, difficulty breathing, and degeneration. Your spine will start to deteriorate if misaligned and left in an unnatural position for too long. This leads to spinal deformity, inflammation, formation of bone spurs, nerve damage, herniated discs, weakness in the limbs, and pain in areas seemingly unrelated to the spine. The Teeter Is The Only Medical Device Indicated For: back pain, muscle tension, degenerative disc disease, spinal degenerative joint disease, spinal stenosis, herniated disc, spinal curvature due to tight muscles, sciatica, muscle spasm, and facet syndrome. Please Highlight The Model With Your Cursor And Click Search. Thank you. UNMATCHED COMFORT & SUPPORT: Patented wrap-around ankle cups for ergonomic fit. Contoured Bed flexes for comfort and optimizes stretch for maximum relief. PRECISION ROTATION FOR TOTAL CONTROL: It’s easy to do – simple arm movements shift your body weight so you can effortlessly invert and return to the upright position. TRUST TEETER: UL 3rd-Party Safety Certification; Heavy-gauge steel parts with patented security features; 5-Year Full Warranty; Easy 5-Step Assembly; 35-Year Legacy; 300 lb, 4ft 8in- 6ft 6in user capacity. Deluxe EZ-Reach Ankle System: The extra-long handle for the ankle lock system reduces the need for bending; made of aerospace-grade stainless steel with a gravity lock safety system. One-Click Balance Feature: The patented pivot system with balance point adjustment makes finding your ideal setting a snap – one click transforms the balance point to accommodate users of different shapes and sizes without the need to remove the bed from the frame. Sleek Frame Design: Creates both an aesthetic and functional benefit – the style is like none other in the market and the curve of the front legs allow easier mounting and dismounting. Pre-set Rotation Control: The EZ AngleTM Tether Strap is a unique feature that allows pre-set angles at 20, 40 or 60 degrees and provides an easy guide to where the benefits of inversion begin and are fully realized. Patent-pending Pivot System: Ensures a lifetime of squeak and rattle-free rotation. EP-970 PREMIUM FEATURES: Extended ankle lock handle for easy securing. Traction Handles and extra-long Stretch Max Handles for added stretching options and assistance. EZ-Angle tether with preset markings at 20, 40, and 60 degrees. Acupressure Nodes provide trigger-point release while Lumbar Bridge supports and focuses traction on the lower back. PREMIUM FEATURES: Acupressure Nodes (8) in varied heights for trigger-point release and focused relief. Lumbar Bridge with adjustable arch for added traction and support. UNMATCHED COMFORT AND SUPPORT: Patented wrap-around ankle cups for ergonomic fit. Contoured Bed flexes for comfort and optimizes stretch for maximum relief. Research has it that inversion therapy helps increase the spinal disc space and reduces paraspinal EMG activity which is an indicator of body muscle pain. Reduction of pressure between the spinal discs and increasing the space between them is what reduces back pain. Inversion table therapy aids the stretching as well as elongating the spinal column. This allows the discs to separate and the vertebral spaces opening where nerves enter and exit. This in turn allows nerve impulses to travel from the brain unhindered. Inversion therapy also increases forward trunk flexion which is the ability to bend over forward by at least 25 percent. Inability to bend over forward severe restrictions to some common daily activities such as putting on socks and shoes. The limitation also causes muscle atrophy. When inverting, the body does not work hard as gravity helps pull out blood which is much easier to get to the brain. This effect also improves the heart functionality as it gets much rest. Reduces Headaches and also helps You To Breath Easier. Inversion therapy, brings about elevated pressure to the eyes and ears. People with retinal detachments or glaucoma may experience pressure on their eyes which leads to eye bleeding. Pressure exerted on the ears also triggers hearing problems and other discomforts. Using an inversion table increases the chances of getting a muscle pull. Staying in an upside down position slows down your heart and this causes an increased blood pressure after a few minutes. This is harmful to your health if you have hypertension. So the next time you decide to go for an inversion therapy, keep in mind the inversion tables pros and cons. Please always consult with your own doctor before considering using an inversion therapy table. The only reason I have covered only the, “Teeter Inversion Tables”, is because they are the only one’s that are the ONLY FDA registered inversion table. Also the Medical Community endorses and they have certain patented items that ensures their quality and safety. How much Time Should I Spend On The Teeter Inversion? Try it twice per day to help your body grow accustomed more quickly. Increase your angle by 10 to 20 degrees per week, until you are comfortable with an angle between 60 and 90 degrees for one to five minutes. Use the inversion table three or more times per day, or whenever you are feeling intense back pain. www.wikihow.com/Use-an-Inversion-Table-for-Back-Pain Please highlight and click search. thanks for sharing this wonderful and awesome post. Hi Abioye, I thank you for taking the time to visit my page and for your comments. The Teeter Inversion Tables are more expensive but they are the only Inversion Tables both recognized by the Medical Community and the FDA. Fitness is a big concern for a lot of people around the world. I like your article on the inversion table. I even did a little more research because I had not heard of the inversion table till I checked your blog. 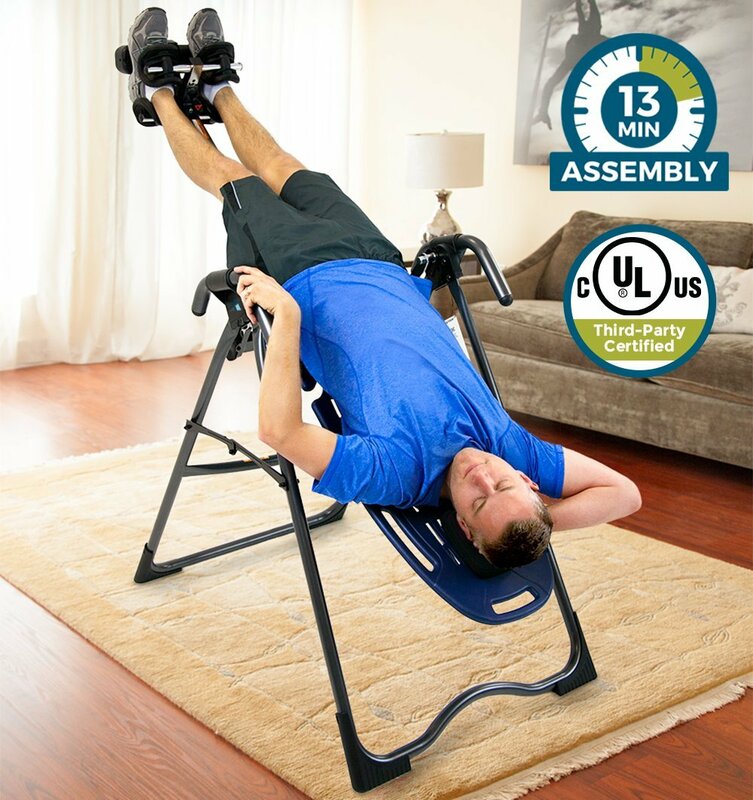 The inversion table can help treat back pain and spinal problems. But, doesn’t it cause blood to flow to the head? Hi Louis, in answer to your question the simple answer is yes. What happens when you get that blood entering your brain. Blood contains oxygen which is very necessary for cell development therefore it is a good thing. I also have a page on Yoga, where head stands are a common practice, inducing brain function. 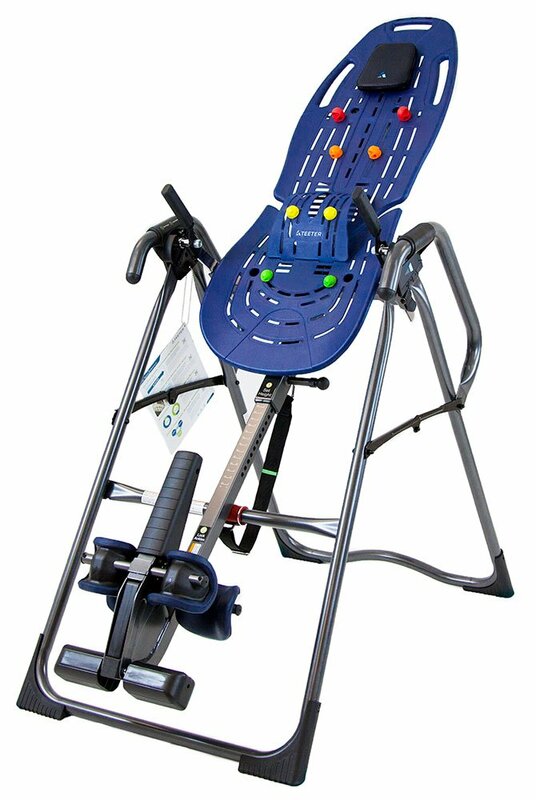 There are several Inversion Tables out there but I only covered the Teeter products because it is the only table recognized By both the Medical Community and the FDA. I thank you for visiting my site and for your comments. I just inserted a link onto that page on, the best practices, times and angles to use when using your Teeter Inversion Table. All the best. I also see that you have mentioned your Dad having high blood pressure, ( I do cover the topic on my site). I would be important (necessary) for your Dad to check with his Doctor first. I thank you for your time, and your comments. All the best. Hi Michael, an interesting topic. I am a pilates instructor and in our studio we have reformer machines. These machines are desgned to mirror many of the benefits of the teeter tables you have outlined such as spinal alignment and back reparation. This is done however mainly with the clients lying on their back in order to protect the spine as we work on the muscles surrounding these areas to strengthen them and ensure that they are firing at the right time. Realgniment is also a big factor that appears to be worked on in both areas. We do have people coming in every now and then asking if we do inversion therapy but I admit I have never really considered them or undertaken any research. I can certianly understand the cons in terms of pressure on eyes and blood flow as these are things we consider in our yoga practices and I can see the advantages in stretching the spine. Thanks for your article and I will definintely be undertaking some more research into this device. The invasion Therapy is good. It’s an exercise and exercising helps us keep fit and keeping fit helps us stay healthy and strong. All the Pro’s makes sense but my issue with this invasion table is the cons that came with it. Exercise are not supposed to have cons. Notwithstanding , who ever that it deemed fit for can purchase it.